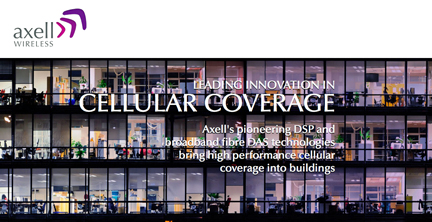 [SatNews] Cobham company Axell Wireless, a worldwide provider of wireless coverage solutions, has launched a revolutionary, in-building coverage solution that allows mobile operators to allocate capacity to locations only where and when it is needed. The system—intelligent digital DAS, or idDAS—provides a more cost-effective way for mobile operators to handle the challenges of large-scale in-building coverage projects. "Over 80% of mobile traffic now emanates from within a building and this figure is growing rapidly," said Cobham Antenna Systems Vice President Fred Cahill. "idDAS allows mobile operators to dynamically allocate capacity around a facility and, in effect, provide a DAS system that can "breathe" and react to user demands." Axell's idDAS solution is based on advanced digital communications and Axell's patented signal processing and filtering techniques. As a result it delivers exceptional low noise performance resulting in increased base station throughput. idDAS operates with every major wireless technology including GSM, UMTS, WCDMA and LTE, and supports all major frequency bands used by mobile operators across the world. It is completely cable agnostic supporting both fibre and copper cable types making it easier to implement in a building. It also includes full and easy support of MIMO for increased data throughput. The system also includes an embedded 1GB IP backhaul per remote, allowing the use of one common cabling infrastructure throughout for WiFi and other IP traffic. Set up and commissioning is handled through an intuitive "wizard" style configuration tool with many auto-setup features, thus saving time and resources during deployment.